This week, we're delighted to have Scott Selikoff & Jeanne Boyarsky helping to answer questions about the new book OCA / OCP Practice Tests: Exam 1Z0-808 and Exam 1Z0-809. The promotion starts Tuesday, April 11th, 2017 and will end on Friday, April 14th, 2017. We'll be selecting four random posters in this forum to win a free copy of the book provided by the publisher, Sybex. Hi Tim! I feel very welcome . Folks, enjoy the week with Jeanne and Scott. I tried, yet failed, to pass the Java 7 exam. I think a book like this would have helped immensely. Thanks everyone! Appreciate the warm wishes! Wow wow wow! I am so excited to see some of the best authors and Java experts in the world connecting out here in Code Ranch. I am a programmer who had to take a 3 year break from my career (motherhood demands) and now trying to get up to speed in the current technologies. Whenever i see women in engineering, it motivates me a lot. Thanks for your wonderful work Jeanne & Scott and Code Ranch team . The site is very helpful and a boost for people like me. As an initial step to kick start the second phase of my career, I am preparing for OCA Java 8, done with 80% prep but still feel there is a long way to go. Once I clear the OCA , I will be starting the prep for OCP. I hope to win this book mostly because i need it and i have never won anything in a loooooong time . Once again , great work people and wishing everyone who attempt the exams the very best. Let's enjoy code in life ! I've been working as application consultant for 5 years but I don't have deep understanding about java. Therefore, I decided to take OCA exam. I am now reading Java 8 SE Programmer Study Guide to take exam in June. It would be great if I could win this so as to do more mock test before actual test. I am an SCJP 1.4 version, although I am aware about the newer features which have been added to the JAVA SDK over the years, I want to know whether this book alone can help me get OCP Java 8 Certified? Anand Kapadi wrote: I am an SCJP 1.4 version, although I am aware about the newer features which have been added to the JAVA SDK over the years, I want to know whether this book alone can help me get OCP Java 8 Certified? If you are familiar with Java versions prior to 8, then I would start with our Java 8 OCA study guide and use this book to practice for the exam. It'll teach you the basics of what you have missed and the tests will prepare you for the real thing. If your already familiar with Java 8 you can jump to this book, although there's many complex topics, especially for the OCP that a full study guide would help with. Alternatively, if you are completely new to programming, we recommend starting with a book about programming concepts, rather than jumping into a certification book. Programmer certifications help developers to strengthen the language and helps them to dive deep. 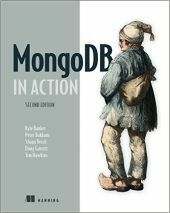 Happy to see this book helping programmers in this direction. 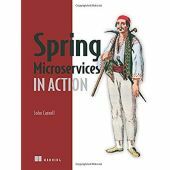 I don't gonna take part in the promotion, because I already have the book, but I would like to thank you, Jeanne and Scott, for your work and your engagement in helping people to prepare themselves for certification and to learn Java. Welcome Scott Selikoff & Jeanne Boyarsky !!! Hello Scott Selikoff & Jeanne Boyarsky and congratulation for your new book. I purchased your book "OCA: Oracle Certified Associate Java SE 8 Programmer I Study Guide: Exam 1Z0-808" and I think that is a material excelent. Welcome Scott & Jeanne with another wonderful book! I am super exited with publication of this book since I am currently preparing for OCA 8 exam and already referring your OCA 8 book. I too wholeheartedly agree with this comment, I used your OCA book for preparation of the exam and am using the OCP book now. And I am sure I will be using this one as well before I finally appear in OCP exam. Welcome to the forum and thanks for writing this book. This is a great book. My company provided a free digital copy through their partnership with SkillSoft. I'm working toward my OCA certification (however I'm not in a rush). So I've been slowly going through it and practicing. I find it very helpful. HI Scott Selikoff & Jeanne Boyarsky ! 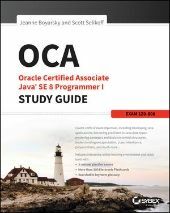 Your book OCA: Oracle Certified Associate Java SE 8 Programmer I Study Guide: Exam 1Z0-808 helped me achieve my first java certification back in February. I used the book and its online counterpart - I could not have passed the test without the pair. With that book and its online counterpart, it took me roughly 3 months to prepare. 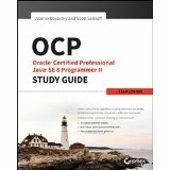 I am now studying for my 1Z0-809 exam using your OCP: Oracle Certified Professional Java SE 8 Programmer II Study Guide: Exam 1Z0-809. I would love the chance to win your practice tests =) . Greetings Scott and Jeanne and welcome to the Ranch. Hope you enjoy your visit and visit us again soon. I'm preparing for the OCA Java SE 8 Programmer I exam this year and has attended the Udemy Java course. I wish this book has some tricky and challenging questions. Would be a good training for my OCA exam. Welcome Jeanne and Scott. Have just completed reading OCP Oracle Certified Professional Java SE8 Programmer II Study Guide and planning to take 1Z0-809 exam next month. Really looking forward to this book. I got my certification(OCA and OCP) with your help through the study guide... Am i am sure even these books will be of great help to people who are preparing for their Certification. 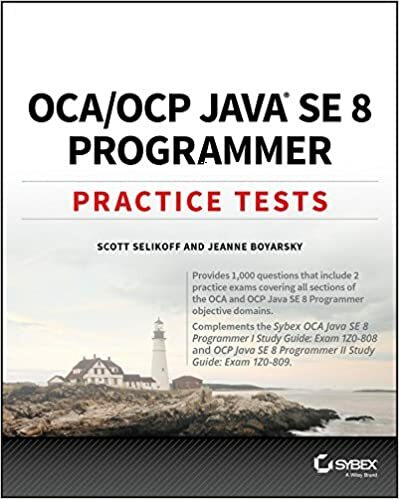 I have passed OCA exam with a help of Oracle Certified Associate Java SE 8 Programmer I Study Guide by Scott Selikoff, Jeanne Boyarsky. I really like the writing style of that book! Now I am prepairing for OCP exam. New book would be a good training for my OCP exam. I wonder who's the winner for this promotion. Claire Chan wrote: I wonder who's the winner for this promotion.